Prince Hock #1 was a monster today. Every so often, he morphs from his angelic self into a booger. The straw that broke the camel's back, was when he snuck my camera to "take" pictures, when I found him with my camera, and scolded him, he threw it on the hardwood floor. Yes, my poor camera is forever broken. Look out Costco here I come to buy a new one. Luckily, I already took pictures of the food I was making, and you can see those below. And luckily, I was able to get him to snap out of his bad behavior and we had an enjoyable evening. This afternoon I made dinner for our friends who just had a baby. They also have a 2 and 4 year old, and I made a dinner that would appeal to them and their parents. My only parameter was to make the meal gluten free because the dad eats a gluten free diet. I made Chex Chicken Fingers, Baked Regular Sweet Potato Fries, Steamed Broccoli, Salad with Honey Mustard, and Muddy Buddies for dessert. I had originally planned on making Cornflake Chicken Fingers, but I found out cornflakes are not gluten free because they have malt in them. These turned out excellent! Let your kiddos help you make the crumbs, they will have fun pounding. Preheat the oven to 400 degrees. Cover a baking sheet with parchment, and set aside. 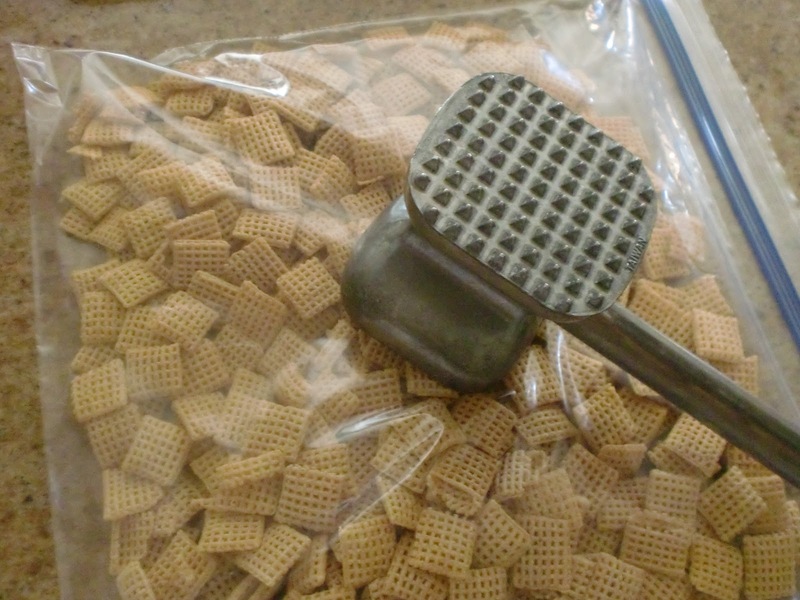 Place the Chex into a large Ziploc bag, and seal. Use a meat mallet and crush to form crumbs. Mix in garlic powder, onion powder, salt, and pepper. Pour onto a large plate. Place the mayonaise into a bowl. Dip the chicken strips into mayo, coating them. 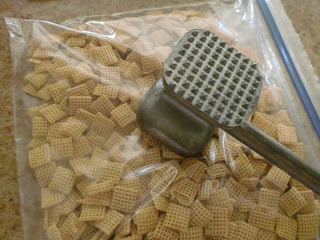 Next, roll the coated strips into the chex crumbs. Place the chicken strip onto the baking sheet, and drizzle with the melted margarine. Put into the oven and bake for 30-40 minutes, or until the chicken is crispy on the outside and cooked through (no longer pink) on the inside. 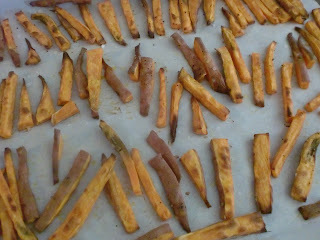 Place the potato sticks on a baking sheet. Drizzle generously with oil. Sprinkle with salt and pepper. Bake for 15 minutes. Toss the potatoes around, and bake another 10-20 minutes, until browned on all sides, and crisp. This addictive treat is sometimes called Puppy Chow because of it's appearance, I think I'll go with Muddy Buddies. This would be fun to pass around during dessert at a Shabbat or Yom Tov meal. It is so so so easy to make. Measure the cereal and place into a large bowl. In a 1 quart microwave safe bowl, place the chocolate chip, peanut butter, and butter or margarine. Place in the microwave and cook on high 1 minute. Remove and stir. If mixture is not smooth, microwave another 20-30 seconds until smooth when stirred. Stir the vanilla into the melted mixture, and then pour over the cereal. Mix to evenly coat. Pour into a 2 gallon Ziploc bag. Pour in the powdered sugar, and seal the bag. Shake until well coated. Pour out onto a piece of wax or parchment paper to cool. Store in refrigerator in an airtight container. Well, I just heard back from our friends, and they gave the dinner 2 thumbs up. Their kids cleaned their plates, yay!